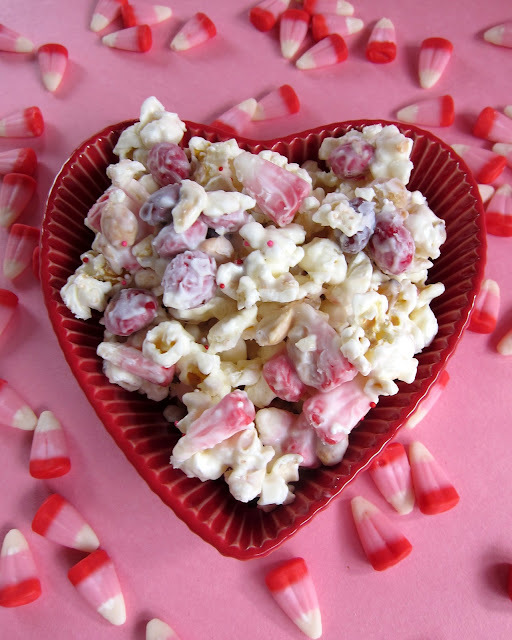 Cupid Crunch - no-bake Valentine's treat! Great for gifts! Everyone gobbles this up! So quick and easy! This week I will be sharing some easy Valentine's Day treats. First up - Cupid Crunch. This is sweet and salty at its best! I came across some Valentine candy corn at Wal-Mart and immediately decided to make this Cupid Crunch. It is made with popcorn, candy corn, peanuts, M&Ms and almond bark. I love to make popcorn snacks. They are so easy to make and extremely addictive! If you can't find the Valentine candy corn, try some mini marshmallows and/or craisins. This makes a ton, so plan on giving some away. It would make a great neighbor or teacher gift. Pop popcorn and place in a large bowl. The largest you have. Pour peanuts, candy corn, and M&amp;Ms on top. Break up almond bark. Melt according to package directions. Pour over popcorn mixture. Stir until everything is well coated and then spread out onto waxed paper, parchment, or foil. Let sit until completely dry and then break up into clumps. Break up almond bark. Melt according to package directions. Pour over popcorn mixture. Stir until everything is well coated and then spread out onto waxed paper, parchment, or foil. Let sit until completely dry and then break up into clumps. How good is this going to be when we are watching our annual Valentines movie tomorrow. thanks for the idea. 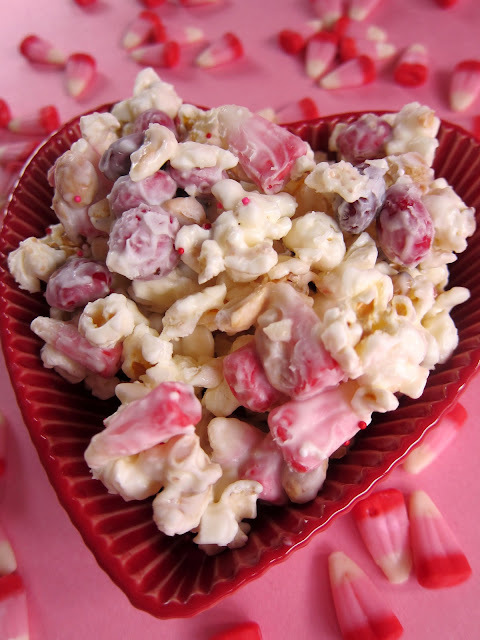 I loved your idea and made this using a bag of pre-popped kettle corn, valentine m&m's, heart shaped sprinkles, milk chocolate chips and white chocolate chips tinted pink. How far ahead can you make this? I think it would be fine for at least 5 to 7 days. If not longer. In the potato chip aisle at the grocery store, there is a product called Puffcorn. I love popcorn but the hull is a dental nightmare. Puffcorn is a great alternative. Try Puffcorn - no popcorn hulls . It's in the aisle with potato chips . I literally have stumbled onto some of the best recipes from you at Plain Chicken! I have printed, shared, and made so many of your recipes it's amazing! Thank you for sharing, I'm a huge fan!!!!!! Thanks!! SO glad you are enjoying the recipes!! !